Serbia has free trade agreements with Russia and the countries of South East Europe (CEFTA). Internationals planning to work in Serbia are required to obtain a Temporary Residence Permit. To get one, you need to submit an application to the Police Office in the territory of residence. The documentation required for granting this permit depends on the reasons for requesting the permit (employment, education, sport etc.) and typically includes a valid passport, 2 photographs, evidence of means of support (such as bank statement attesting to availability of funds), employment contract, explanatory letter re: the need for employment written by the company, or decision on registration of the company (if you are owner or representative of a company). It normally takes about a week to process the application. Belgrade City Police (Department for Foreigners), Savska 35, tel. 361 89 56. The most popular place for children in Belgrade is the Zoo, nestled against the Belgrade fortress. The Zoo, founded in 1936, is also called 'Good Hope Garden'. Its stars include the only white buffalo in Europe, a couple of white lions and a white wallaby. Children adore the Baby Zoo, home to the cubs born in the zoo. Open 08:00 - 20:00, in winter 08:00 - 17:00. Admission is 250 din for adults and 200 din for children aged 3-15. Majdan Children’s Cultural Centre, Kozjačka 3-5, tel. 369 26 45. In addition to ballet classes, it offers piano lessons, and there is a skating rink open all year round, tennis, footbal and basketball facilities. 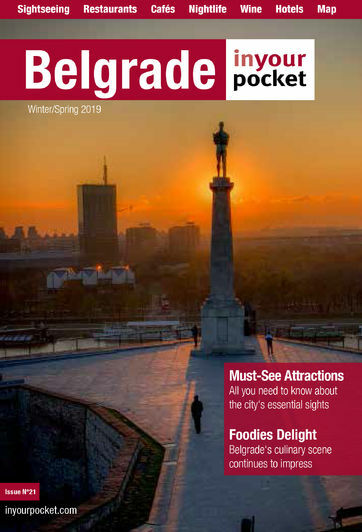 You may be labouring under the impression that Belgrade is a shopper’s paradise, having seen trendy and chic Belgrade girls, but alas, Belgrade is not so strong in the shopping department as Milan or Paris. Belgrade’s main shopping areas are Knez Mihailova, Terazije, Kralja Milana, and Bulevar Kralja Aleksandra streets. Most shops are open between 10:00 and 20:00. The main supermarkets in the Old Town are Maxi and Alonso, both located at the corner of Višnjićeva and Gospodar Jevremova streets. Larger supermarkets can be found in New Belgrade, on Omladinskih Brigada Street, near Airport City (Idea and Rodić) and on Treći Bulevar Street near Holiday Inn (Super Vero), open 08:00 - 21:00, Sun 08:00 - 17:00. If you are seized by a sudden urge to go shopping for oregano, underwear or a TV set at 2 o’clock in the morning, go crazy at Tempo, a huge supermarket in New Belgrade, near motorway exits for Novi Sad and Zagreb, open 24h. There are small shops selling newspapers, cigarettes, chocolate, spirits and juices throughout the city, open 24h. Teeming with people and colours, green markets offer fresh fruits and vegetables, meat and fish, scrumptious meat and dairy products, pickles, honey, herbs and more. Officially open 06:00 - 19:00, but you will be wise to observe the times below, as farmers selling their own goods are eager to go home earlier. An islet in the Sava River dubbed as ‘Belgrade’s Sea’, it is the most popular swimming venue and outing area in Belgrade. The tips of the islet are connected to the mainland with embankments, thus creating an artificial lake 4,2km long, with an average width of 200m, and the depth of 4-6m. Both sides of the lake feature fine pebble beaches, dotted with cafés, restaurants and numerous sports venues. There is also a designated picnic area. The swimming season (when beach lifeguard service operates from 10:00 to 19:00) is open from 15 June to end September. The water is warm and clean, but rather muddy, so you cannot see much when you dive. In addition to water sports (swimming, kayaking, rowing, windsurfing, water skiing, fishing) Ada Ciganlija offers a great number of free venues for football, basketball, handball - you need only bring a ball and a crowd, plus there is a trim trail, biking and roller-skating paths, facilities for table tennis, tennis, bowling, artificial rock climbing, a bungee jumping platform (55m high), a nine-hole golf course, mini golf, rugby, field hockey, paintball, aqua football facilities, artificial alpine skiing and snowboarding slopes, skateboarding ramps, adventure park, and more. There is also a Robinson Crusoe Island theatre and entertainment feature for children.